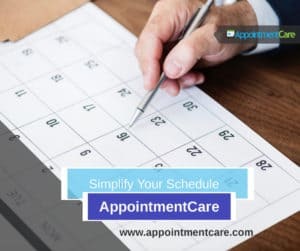 As many of our customers businesses have been growing we have are in the process of improving your experience by adding more features to AppointmentCare. This one was requested as some businesses were managing a lot of service providers and the concern was that the too many employees would be able to change settings or inadvertently delete a service. This update also allows the Admin or Scheduler role to view calendars of other employees. We have recently deployed Roles feature, where businesses will now have an Admin role and access to all their employee’s calendars. The Admin will be able to assign employees to new roles, setup services for the company among many other setup permissions. This new feature will also add a Scheduler role that will let a staff member schedule appointments for other staff members that they are assigned to. This will allow a receptionist or someone else handle appointment scheduling for groups of people. The last role is Service Provider and that would be the person that would be providing service to your customers or in meetings with them. If you login as a regular staff, you will only have access to the calendar of that staff member. You can assign as many employees to an admin rile as you wish. This will have to be done through the default email for your account when the service was set up. You can assign “admin” role to any other staff. There’s a “Roles and Permissions” page under the menu that describes the abilities of each role. This has also been attached at the bottom of the email. How Convenient Are Online Appointments for Customers?